Yogacharya Sri B.K.S. Iyengar dedicated his life to the study, exploration and development of yoga. He was born is 1918 in India and spent over 70 years in continuous practice of every aspect of yoga. 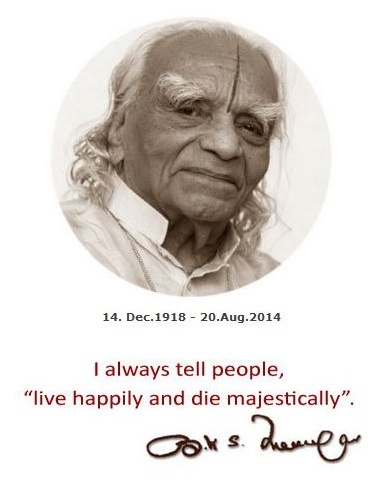 Sri B.K.S Iyengar died on the 20th August 2014 and is survived by the world famous Ramamani Memorial Iyengar Yoga Institute in Pune, India, along with his son Prashant, daughter Geeta and four other daughters. He taught teachers all over the world, and has written key works on the philosophy and practice of yoga, of which the best known is “Light on Yoga”. Iyengar yoga is characterised by attention to awareness, detail and precision of instruction. The system of teaching is methodical and progressive, emphasising detailed correctness and absolute safety. BKS Iyengar pioneered the use of props and equipment to aid the practitioner in achieving the postures and to encourage greater understanding of how to use the yoga postures; making yoga more accessible to us all. His teaching has reached people from all walks of life in all parts of the world and Iyengar yoga is now the most widely practiced form of yoga. Through his teaching he has made yoga accessible and relevant to people, no matter what their background or ability. To read more on Guruji / B.K.S Iyengar’s life please read The Guardian’s obituary or listen to Guruji’s radio interview in the 1980′s.